Low-temperature drying, also known as near-ambient drying, is one of in-storage drying methods. There are four major factors which influence low temperature drying the variability of weather, the harvest moisture content, the air flow in the storage bin and the amount of heated air. Scanair low-temperature heat pump dryers are built to dry grain as slowly as possible, while in the same timeless spoilage on the grain. It is suggested that low-temperature drying system is better operated when the average daily temperature is between 30°C and 50°C. Rather than control the drying air temperature, the low-temperature drying focuses on the relative humidity in order to achieve equilibrium moisture content (EMC) in all grain layers. Low-temperature drying process usually takes 5 days to one month depends on several important variables weather, airflow, initial moisture content and amount of heat used. Among which, airflow is the key factor. Without appropriate airflow rate, spoilage will occur before drying is completed. By using heated dried air with Scanair Solar Assisted Heat pump Dryers the relative humidity of the drying air is better controlled to achieve the desired moisture content in the air of drying process. Cardamom curing is a process in which the moisture of freshly harvested capsule is reduced from 80% to 10to 12% at an optimum temperature of 50oC so as to retain green colour to the maximum extent. This is the most important part of the process as it affects the quality of the final product. It is important to dry the cardamom capsules as soon after harvest as possible to prevent the loss of flavour. It is also important that the drying process is as short as possible so that mould does not grow on the capsules and the bright green colour is retained. The drying temperature should not be above 50°C as this affects the colour and delicate flavour of the final product. In most places, cardamom capsules with a good green colour can be sold for a premium price. The moisture content of a fresh cardamom capsule is about 85%. This needs to be reduced to 10% in the dried product so the cardamom capsules can be stored. If the drying period is too long mould can start to grow on the cardamom. There are several options available to the small-scale processor, depending upon the size of the business and the local weather conditions at the time of processing. Each method has different advantages and disadvantages. The combination of average drying conditions of 34.6ºC temperature and 27% relative humidity were very effective in drying peanut. There was no loss of seed coat colour and darkening of the cotyledons The physiological quality of the peanut seed was maintained by the new technology dryer. Drying with low temperature and relative humidity at recommended air flow rate did not reduce the observed that slow drying or low temperature/low humidity drying reduced physical damage and maintained high vigour and viability during storage. The maximum recommended plenum temperature is 35°C and the minimum plenum humidity is approximately is 50% in peanut seed vigour index based on germination speed when the drying temperature was increased from 43.33 to 104.44°C in a hot air drying system. A slight increase in germination percentage from 82 to 89% was observed which could be attributed to seed pathogen control due to the HPT drying process. The seeds after drying produced no abnormal seedlings due to fungi infection as observed in the test with wet seeds dried peanut seed at 34.1°C and 40% RH and obtained germination value of 76% which was 13% less than observed using the HPT dryer system. 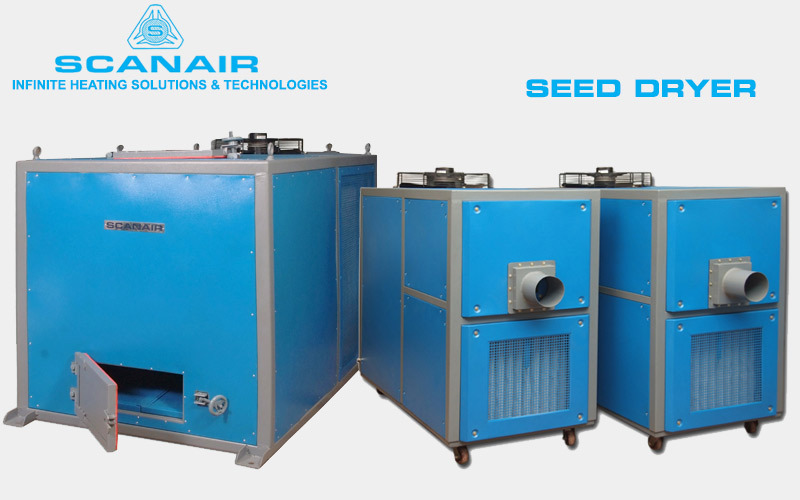 Peanut seed drying provided by the heat pipe technology is an efficient process and caused no detrimental effects on seed physiological quality. Drying is an energy-intensive process which involves the removal of moisture from a crop until the moisture content of the crop is in equilibrium with the surrounding air. Crops are usually dried to a moisture content that will allow safe storage and/or further processing eg. Milling .The drying behaviour of different crops depends to a large extent on the physical characteristics of the crop for example particle size, internal structure and composition. These characteristics are crop specific, and so the drying behaviour of crops is usually different. In order to select an appropriate dryer and the drying parameters such as drying time and temperature, it is important to understand the drying behaviour of the material to be dried. This principle forms the basis of many drying studies, which are conducted to determine moisture loss characteristics, physical and biochemical changes of specific crops. The traditional method for crop drying in the tropics is sun drying. Sun drying usually involves the spreading in thin layers of crops such as paddy, coconuts, coffee, shrimp and fish on concrete floors, large trays, galvanized sheets or simply on pitched roadsides until the crop is sufficiently dried. This method has its inherent advantages of no operational energy cost for moisture evaporation, together with a low or negligible initial investment, except for the larger sun drying installations such as those used in Guyana for paddy or in Grenada for cocoa beans. These may require as much as 180 m2 of drying floor space per ton of paddy. There are several limitations associated with traditional sun drying. During periods of intermittent and particularly during continuous rainfall, crop drying is not possible and the risks or crop losses are high. Sun drying is slow and weather dependent compared to other alternative drying systems. Crop quality may be low due to contamination by dust, dirt, stones and insects, while direct crop losses from theft and livestock consumption can be high. Sun drying also suffers from a high labour requirement and excessive crop handling particularly in periods of inclement weather which can result in high costs, crop damage and a loss in quality. 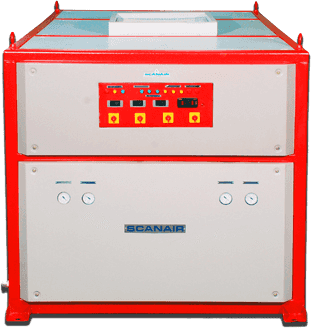 Scanair fish dryer machine adopts international standard quality which is suitable for small and medium scale production. The smallest type can be operated by only one person, and this machine needs no installation, it can put into production directly when the machine is delivered. The customers can purchase one or more dryer according to your needs. Also, we offer customized dryer for them. The machine can able to set the drying program of temperature and humidity in the drying process which will truly dry the materials in the good quality. Scanair heat pump dryer widely used to dry fish, meat, herbs, fruits, vegetables, seeds, seafood, noodles, etc., The materials after drying will have good quality and nice appearance. Also, it has less energy consumption. Compared with the traditional dryer, it can save 70 % energy and the drying capacity can improve 50 % in production. Scanair Heat pump dryer running cost just as 40% of oil dryer, 50% of coal burning boiler, 30% of electric boiler. Heat pump dehumidification drying method of the closed cycle, saving costs, no exhaust waste heat emissions, no noise pollution, environmental protection etc, Methods of heat pump Drying process material no deformation, no cracking, no-discoloration, no deterioration, and no oxidation, thorough drying after drying and rehydration, less loss of nutrients, the long storage period, more than any conventional drying equipment to more effectively protect the color of the dried material, smell, last, individual form and active ingredients. Scanair can design and fabricate drying equipment according to customers requirements like a walk in Drying Chamber, tray dryer, drying room, conveyor drying tunnel, Elevated Temperature, Cold room with humidity control, heated room with humidity control etc, installation and operation made easy, just need connecting with drying chamber plug and play. 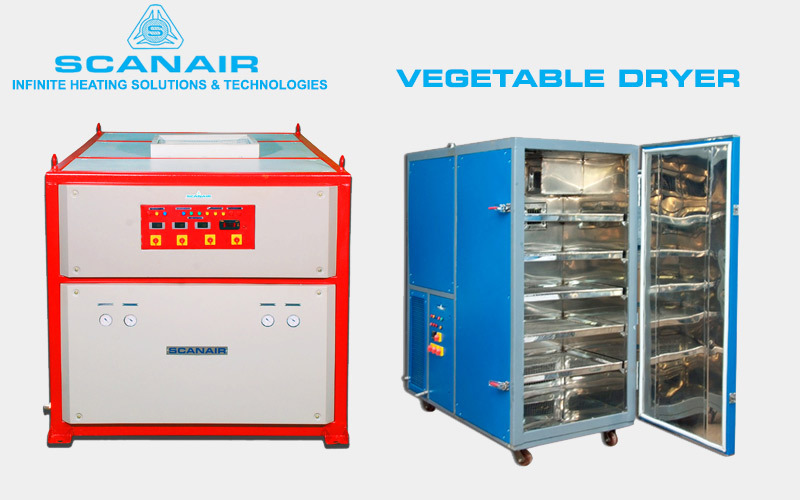 Scanair manufacturer of a wide range of Vegetable Tray Dryer and Drying Ovens attached with heat pump dryers, that is widely used for heating, ageing, drying and many other drying purposes, located in Chennai, India, Scanair range of Drying Ovens are designed for parallel placement of the material that results in increased production and saves batch timing by convenient loading and unloading. This types of Tray Dryers are available with external temperature control panel, and high temperature can also be fabricated. Owing to the superior quality of our products, our wide range of products are widely used in the Industry. Moreover, these ovens are available in various sizes and models to choose them. Tray Dryers are used to obtain a high-quality dried product, fruits, vegetables and meats need to be prepared before drying. Good preparation practices are a prerequisite for the final dried product quality. Fruits and vegetables must be washed prior to drying to remove soil and other foreign materials. Damaged parts must be removed. Fruits and vegetables should be peeled and cut into small, uniform pieces. Fish should be de-scaled and in some cases skinned before cutting into uniform pieces. The smaller the food piece, the faster it will dry. Selecting the appropriate temperature for drying is very important for good product quality too high temperatures can lead to product darkening, discolouration and case hardening. Too low temperatures can lead to slow drying and food spoilage. A good, safe temperature for drying many foods like above is 40 – 60˚C. However, this must also be accompanied by good air movement through the dryer. Heat pump drying technology applied to food materials to heat sensitive materials, usually freeze-drying, drying costs are too high, while moderate heat pump drying with the drying conditions and drying parameters that is easy to control, and freeze-drying can preserve the quality of similar products. Moreover, the heat pump drying can maintain the better quality of dried products, heat pump drying in a closed structure, results in vitamins and other nutrients being retained and the drying of volatile components, First, the sensitivity of the food materials used in dry, easily oxidized material (such as flavour compounds and fatty acids) will produce in the dry oxidation process, the flavour, colour and rehydration are worse. Second, the heat pump drying also belongs to convective drying is more suitable for drying granular materials, Heat pump drying of food materials using the new drying medium, through the application of inert gas to replace air as the drying medium, so the resulting dry product during the drying process will not produce oxidation reaction, and the product quality is further improved. Heat pump fluidized bed dryer design and use can significantly improve drying quality, and the initial investment and running costs are far lower than the low-temperature drying. Drying removes the moisture from the food so that bacteria, yeasts and moulds cannot and spoil the food. It also slows down the action of enzymes but does not inactivate them. When the food is ready for use, the water is added back and the food returns to its original shape. Foods can be dried in an oven or in a food dehydrator by using the right combination of warm temperatures, low humidity and air current. The optimum temperature for drying food is 40˚C. If higher temperatures are used, the food will cook instead of drying. When the food cooks on the outside and the moisture cannot escape, “case hardening” can occur. The food will eventually mould. Thus, the drying process should never be hurried by raising the drying temperature low humidity aids drying process food contains a lot of water to dry food the water must move from the food to the surrounding air increasing the air current speeds up drying by moving the surrounding moist air away for the food to speed the drying time, increase the air flow operation instructions of mushroom drying application temperature heating meter settle the range temperature of automatic heating from 40 to 60 degrees. Low temperature it will heat high temperature it will stop then this can keep the constant temperature in the drying equipment dehumidification meter settle the range humidity of automatic dehumidification the error can be controlled under 3 % which can control the humidity automatically 3time controlling we can settle it at the certain time blower button start the blower which will make the average temperature and good drying effect. We offer industrial scale heat pump food dehydrator systems to dry any product that is ideally dried between 30°c and 80°c Gentle, low temperature and controlled drying means consistent, high-quality output. Ideal to preserve colour and taste of food products low operating costs due to very high energy efficiency (up to 60% reduction in energy costs versus traditional drying technologies). Less energy use also means less waste heat generated in the space where the dryer operates, further increasing operating savings. As opposed to solar drying, the drying temperature and humidity are not affected by ambient conditions. Every day is a perfect drying day the drying systems consists a dehumidifier a chamber and product trays. Depending on the type of product and the amount of moisture that needs to be removed, these items are combined into a system. As part of our service, we can work together with you to determine the optimal drying cycle and design the best drying system for your product. Below we describe each of the components and some common combinations, our standard units.